I have no idea whose button that is on the left, or where this award originated, so to whoever deserves the credit, please know that I really do want to give you the recognition you deserve! What has been your favourite series of all time? Series... hmm... Kristin Cashore's Graceling Realm series. I could read that series over and over. Robin LaFevers' His Fair Assassins series and Sarah Fine's Guards of the Shadowlands series are great ones too. If you could have a book turned into a movie, which would it be and why? I generally dislike book-to-movie adaptations... but NIL by Lynne Matson would make a cool movie. It's very Survivor/Lost-esque. I would dig that! What is your most anticipated read of 2015? Both are contemporary. WHAT IS HAPPENING TO ME. What book character have you been able to relate most with? Probably Harper from Through To You by Lauren Barnholdt. Gosh, that book spoke to me. Twilight, Harry Potter or Percy Jackson? Percy Jackson, hands down. Mostly because I had already loved Greek/Roman mythology, but also because the series is so amazing! Do you prefer having your books in pristine condition or worn out (creased spine, folded corners, etc.)? Pristine. Oh my gosh I am so OCD you don't even want to TOUCH my books, for fear of being swatted. Or possibly worse. Best book cover that you've ever come across? Ohhh, that's so difficult. I have a whole Pinterest board for this. Go there. What would you say has been the hardest part of being a blogger? I have a very rigid schedule, and I post content every day. So, that. A love of books, an interest in website/blog coding, and a desire to be part of the online bookish community. Who is your favorite book blogger? I don't have one favorite. I love Pili, Jess, Nikki, Nereyda, Ashley, Carina, Kel, Danielle... there are so many, and all for different reasons. If you had to chose ONE book to read for the rest of your life, what would it be? Again, Fire by Kristin Cashore. Have you ever tried to start to write a book? If so, what genre? Ha. Ha ha. Please don't ask me, I have no idea. Where is your favorite place to read, and why? My room, because it's comfortable. Worst book you've ever read, and why? See my 1-star tag. Chances are, I had plenty of reasons. Are you reading any books for school? Which ones? What is a book you don't want to read in public because of the cover? See my historical romance tag. You'll know why. That is a cute blogger button. Fun answers! I still need to read Kristen Cashore's books. And oh my goodness, your more anticipated books for next year are contemporaries??? Where's my Alyssa and what have you done with her?? JK, JK, hehehehe. I might do this tag for Thursday if I cannot work on my cupcakes in time for it! THANK YOU :D :D :D :D :D And omg yeah, there is obviously something wrong with me... or maybe my personal life is such a mess right now that I need to read about other people's happy romance to feel better. Haha. I'll look out for the post! CUPCAKES ARE AWESOME!! I <3 you. Just fyi. AND RIGHT? ;LAST YEAR'S MISTAKE OMG. ALSO YOU'RE BECOMING A CONTEMP FAN AREN'T YOU? ;) I CAN FEEL IT. Ahhhh, thankies!! YOU are awesome. 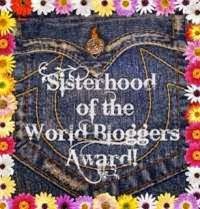 And you listed me as one of your favorite book bloggers! Aww, you are so sweet! Yeah seriously though O_O And you're welcome!! Haha yes OMG I'm OCD about my books too! I don't mind reading them but I'm always careful with them and also FYI never read a hardcover with the dust jacket on, it sits on the shelf and continues to look beautiful while holding place! I totally know what you mean, about the hardcover and dust jacket!